In 1957, Mike Todd's Theater Cafe (formerly the French Casino, Rainbo Gardens) was converted to an ice skating rink, called Rainbo Arena, which was a practice rink for the Chicago Blackhawks including the year they won the 1961 Stanley Cup. 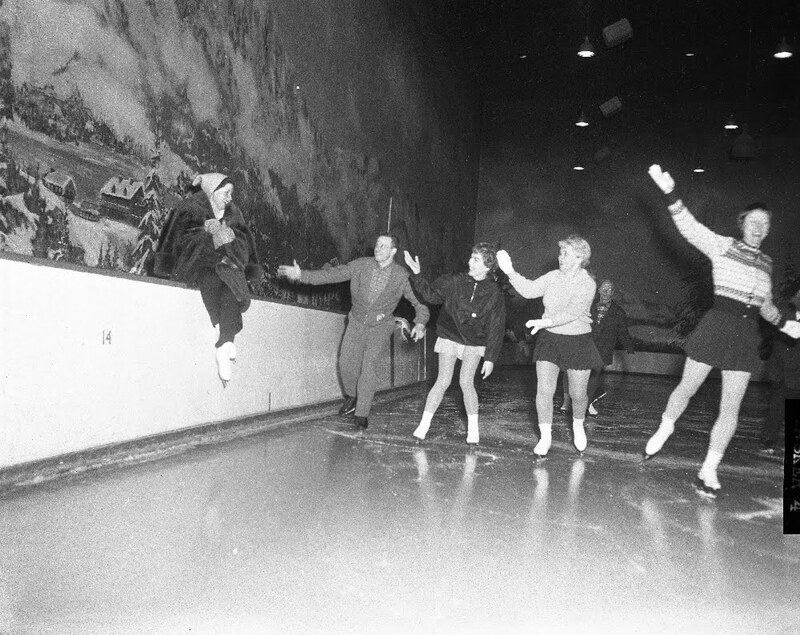 The Rainbo Arena was also a training rink for several Olympic figure skaters, housed a pro bowling alley, and the original Kinetic Playground music venue. You definitely should...let me know the links when you do and I'll talk 'em up for you here. My friends and I played hockey their in the late 60,s early 70,s. I played hockey there too, 1968 to 1972. Met my future wife there, in 1971. Great memories. I had memories of ice skating lessons there I will always remember. I have the badges we use to get. I remember being a French Pussey Cat and Christmas Tree in a line skating show back in the 1960's. Boy did I use to like to skate fast around the rink. I was a lead skater in one of those shows and most likely skated too fast as some were falling down in the show. Played hockey there with Illinois State IceBirds in early 70's, and then with Peoria Blades, a semi pro team. Loved the big mural on the wall with Alpine scenes! In my memory FOREVER ! I learned to skate there as a kid in the early 60s, lots of fun. I spent every wednesday friday and saturday there 77-1980, mike taylor, sue and barb, who else is out there remebering this place. wow! I lived 1 block from the Rainbow back in 1980. Clark and Lawrance. place was across the street from the cemetery. We had so much fun there skating and going there on the weekends. Right next door was Tina's where they had the best Italian beef sandwiches. My god I miss that place and Chicago for that matter. Feels like I was skating there yesterday. Unforgettable! Anonymous -- I played hockey there from 1962-63 for the Maple Leafs and coach Nello Menoni. The only rink in Chicago at that time. Hooked on the game ever since! !